Distinctive Element: LeaderTreks partnered with industry experts to develop a team roles assessment specifically for students. We’ve spent years observing each of these team roles in action throughout our experience in youth ministry. 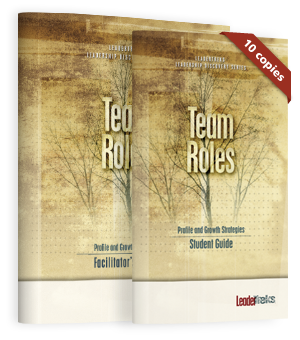 Based on our observations, we created the team roles assessment to help youth leaders understand the leadership roles students naturally fill on a team. This helps your students understand how God has wired them, and it helps you find the leadership role that capitalizes on their strengths. Why a team roles assessment? This assessment helps students determine what roles they tend to play on a team. These leadership roles fall into three categories: Task roles, social roles and destructive roles. Through this introspective process, your students will be able to understand what it means to function effectively in a team environment. The results of this assessment will help students discover the roles they play; learn what their destructive tendencies are and how to avoid them; and see the value of the other roles on the team. This assessment is extremely valuable for developing teamwork and empowering leadership. Biblical Background: In John 10, Jesus uses the illustration of a shepherd and his sheep to explain our relationship with Him. It’s a tender picture of our role on Jesus’ team. As a member of His team, we must rely on Him to provide for our survival and to help us accomplish each day’s tasks. We must model His diligent concern for all. We must also remember to be gentle with each other’s weaknesses as part of the global flock that follows the same Shepherd.